It was a Sunday afternoon in February. Our family had gone into town for church that morning. Kris and the kids stayed in town for church functions in the evening, and I went back to the ranch to feed cattle. It was along about five in the afternoon when I fed the East Pasture. I found the cows in one bunch, at the windmill near the mouth of Point Creek Canyon. I poured out their feed on the ground and walked down the line, counting the cows. This was calving season and it wasn't unusal for me to come up one or two cows short, but this time I got the full count. I headed west toward Picket Canyon, driving up a steep rocky road that led to some top country. I drove across the flats and was about to take the trail down into Picket Canyon when I noticed something off to my right. At first I thought it might be an antelope, but as I drew closer, I saw a baby calf lying in the grass. I drove over to it and stopped. The calf was alone. I had just fed all the cows in this pasture and had gotten a full count. I knew for a fact that there wasn't a cow within a mile and a half of this little feller, yet here he lay, alone and in plain sight on the bald prairie. 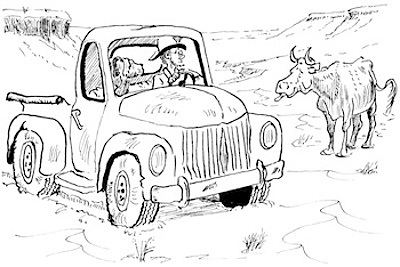 Cows didn't always take their calves to the feed ground, but why would his momma park him a mile and a half away—on the flats where he could be seen by prowling coyotes? A smart cow would leave her calf in a ravine, a few hundred yards from the feed ground, and go back to him as soon as she had eaten. Something was wrong. Things didn't add up. That calf shouldn't have been there, and the next question was, should I intervene? Everything in my experience said, "No, leave it alone." In almost every situation, it's a mistake to disturb a baby calf. But it was getting along towards sundown and this calf sure looked like coyote bait. I decided to get out of the pickup and approach him. If he jumped up, I would leave. If he allowed me to catch him, I would haul him down to the herd and turn him loose, hoping that he would find his careless mother. I approached him one step at a time. He flinched but didn't run, and I was able to grab him. I loaded him into the back of the pickup and tied him down with a piece of rope. I drove back to the feed ground and turned him loose among the cows, but before I turned him loose, I bobbed the hair off the end of his tail so that I could identify him. He bawled. Several cows came over and sniffed him, then walked away. He fell in behind a Hereford cow and followed her away from the feed ground. That looked good...until I identified the cow. Her calf had frozen to death one night when the temperature dropped to 12 below zero, and I knew she was a dry cow. They didn't belong together, and it began to appear that I should have minded my own business. If the calf's mother was around, she wasn't claiming him, which was very odd. Well, I didn't know what to do except leave things as they were. If the calf hadn't found his mother by tomorrow, I would have to assume he was abandoned. I would catch him, take him home, and raise him on a bottle. I headed west again. On reaching the flats, what do you suppose I saw on the horizon? A large four-legged animal trotting towards the southwest end of the pasture. It was Momma Cow, and she was headed straight to the place where she had left her calf—but I had just hauled him a mile and a half to the east. Mister Smart Guy. Mister Ranch Management Expert. I drove away, thoroughly humiliated and confident that Mrs. Cow would sort out the mess I had made of her family, if I would just leave. And she did. The next day they were together on the feed ground. Why had she left him alone, a mile and a half from herself and the other cows? I have no idea, but if the cow knows what she's doing, it isn't necessary for me to understand it. There's a lesson here, and it's a hard one to remember. No matter how clever we ranchers think we are, none of us knows more about the cow business than a mother cow.